The genealogy and musical roots of FIREFALL run deep into the fertile soil of American rock and folk rock music. It began with Woodie Guthrie and later, Bob Dylan, evolving into the Byrds and the Buffalo Springfield. The genre established by these luminaries continued with Crosby, Stills and Nash, Manassas, The Band, Neil Young, The Eagles, Poco, Loggins and Messina, The Flying Burrito Brothers, Gram Parsons and Emmy Lou Harris, Dan Fogelberg, America and FIREFALL. Many of these participants mingled in the studio and on tour. Individually and collectively they created a sound that changed the world’s musical landscape. 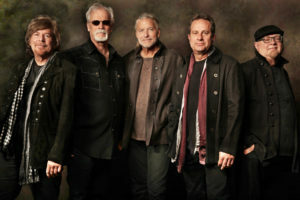 FIREFALL is one of the few surviving bands of this genre, remaining true to its founding vision and roots despite personnel changes over its 40+ year history. The band transcends and embraces many industrial labels- rock, soft rock, country rock, contemporary country, easy listening and Americana.